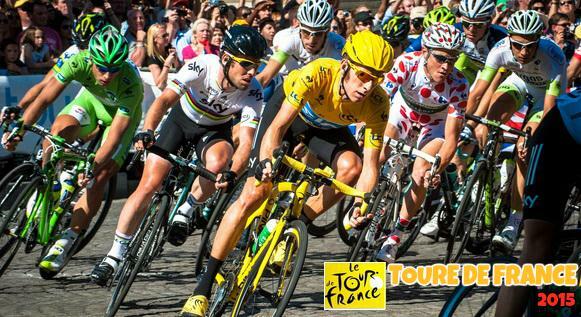 Le Tour De France 2015 will be the 102nd edition of the world famous cycling tour which will start in Utrecht, Netherlands on 04 July 2015. 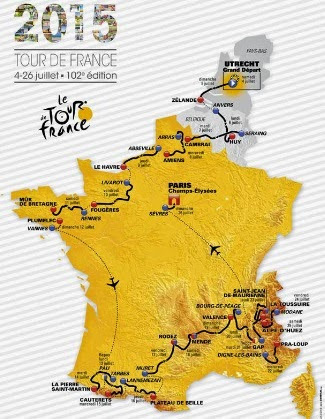 There are number of rule changes ahead of the 2015 tour de france the most important one being “time bonus” which will be awarded to top 3 cyclist in each of the 7 stages (from 2nd to 8th stages). With the winner of stage getting 10 second bonus, runner up 6 and third placed 4 seconds. There is also change in the sprint race point system with winner of sprint race getting 50 points, runner up 30 and third place 20. No time bonus in the sprint races. The first race will be in Utrecht, Netherlands which will be a time trial and set to take place on 04 July. There will be two time trial stages, 8 Flat stage, 7 mountain stages and 4 medium montaint making it a grand total of 21 stages over the period of 23 days. Here is the full list of stages and dates.